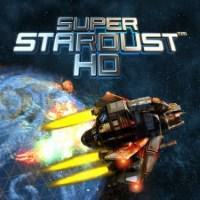 A twin-stick shooter played on the surface of a sphere (and an enhanced remake of Super Stardust on the Amiga). The core gameplay is Asteroids -like with large rocks that break down into smaller ones and occasional enemies, but with a few sources of added variety. There are three different weapons to switch between for different playstyles - a spread shot, a focused long-range shot, and a whip-like beam. The behavior of different enemy types (including the periodic boss fight) present varied challenges to respond to, and each asteroid and enemy type is vulnerable to a specific weapon. Enemies and asteroids will occasionally drop pickups that include weapon upgrades, bombs, single-use shields, extra lives, or simple point bonuses. The player also has two panic buttons - the aforementioned area-clearing bombs and a rechargable boost that confers a burst of speed and invulnerability. These increase the game’s competence zone significantly - and in the case of the boost, actually raise the skill ceiling. Point bonus pickups are worth more when grouped up and boosted through, so a player skilled enough to use their boost to maximize score pickups instead of escape death will get more points faster. The fact that the game is played on a sphere means the player is never at the edge of the stage as they can be in other similar games, which removes the frustration of getting cornered or being killed by something that spawns more or less on top of you. Here, there’s always somewhere to go and you can tell when new enemies or asteroids are coming. The result is a lot of frenetic fun that’s challenging enough to require some serious reflex-honing. It doesn’t hurt that the game has gorgeous visuals, a great soundtrack, and a few other play modes if you get tired of the normal game. As a historical note, it was also the first PlayStation 3 title to support trophies. I Stopped Playing When: After playing a ton of Arcade and Endless mode, I felt like I’d more or less conquered both.